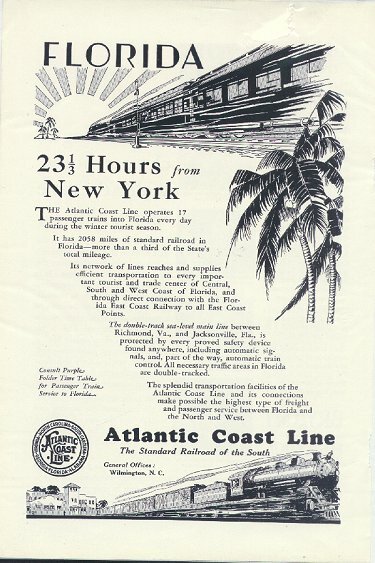 "1930 - Atlantic Coast Line - Florida to New York." (987) 1930 - Atlantic Coast Line - Florida to New York - Condition: Very Good Wonderful Ad done in Black and White with Artistic Illustration. The ad explains that the Atlantic Coals Line operates 17 passenger trains to Florida each day during the Winter Tourist Season! This ad was done in 1930 and measures 7" by 10". .